This is a perfect holiday or non-holiday dish! I made this, and ended up eating the entire thing – oops. It was such a good blend of sweet and savory, and it’s a super simple dish with a lot of flavor. I adapted this recipe from Rachel Schultz’s blog, and she has some great stuff and additions to this dish, so check it out! I actually did a smaller portion of this dish and used Trader Joe’s already seasoned brussels – just one pack, so you may check that out! Mmmmmm!!! Heat brussels sprouts, cranberries, and olive oil in a skillet over medium heat. Season with salt & pepper. Cook for 8-10 minutes. 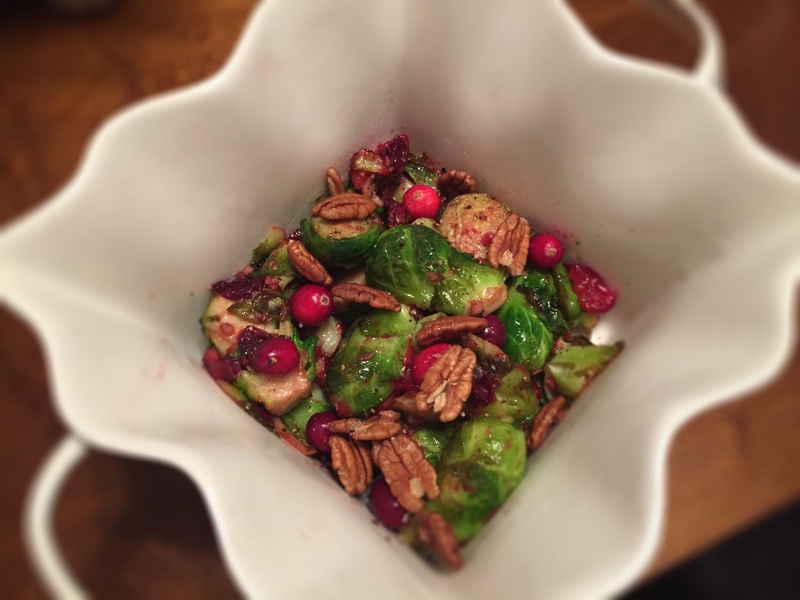 Toss sprouts, cranberries, and pecans in a large bowl. Top with gorgonzola if desired.